The smoke and carbon monoxide alarm that thinks, speaks and alerts your phone. There’s never been a smoke and CO alarm quite like this. 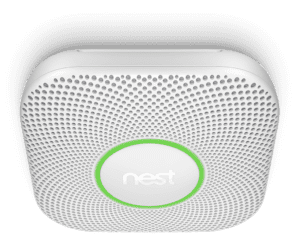 Nest Protect looks for fast-burning fires, smoldering fires, and carbon monoxide. It also speaks up when there’s a problem, can be hushed from your phone, and it will even message your phone in case you’re not home. Get alerts on your phone. Nest protect can send you a message when there’s a problem or the batteries run low. Tells you what and where. See the CO you can’t. Carbon Monoxide is an invisble, poisonous gas. Nest Protect tells you where it is hiding. The Split-Spectrum Sensor looks for both fast and slow burning fires. Hush from the Nest app. Just burned popcorn? App silence lets you quite the alarm from your phone. Nest Protect’s long-lasting sensors help keep you safe and sound for up to a decade. Nightly Promise is a quick green glow when you turn out the lights that say’s everything’s working well.